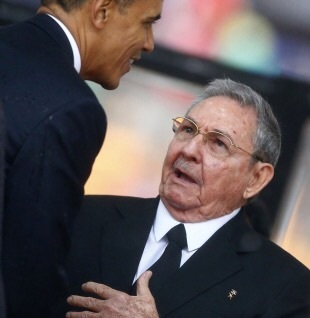 Obama and Raul Castro shake hands befor Obama’s speech. When the Soviet bloc collapsed in the 1990s under the blows of the pressures of imperialism, its internal contradictions, and the bureaucracy who were playing an active role in capitalist restoration, many observers predicted the fall of the Cuban regime. And it is true that the island, dependent on Soviet aid, went through an unprecedented crisis, the Cuban economy drained, in what the Cubans called the “special period.” The economy, within certain limits, took a decade to rebuild (with the participation of the state but also with European capital in the tourism sector and later with the help of Venezuelan oil), but without overcoming a series of structural problems compounded by the US embargo, strengthened by the Helms-Burton act. The bureaucratization of the regime, the stifling of democratic freedoms, and the effects on popular mobilization have weighed on the situation of the island. Alongside the interventions, now, of Raul’s daughter Mariela Castro, the restrictions on the autonomous self-organization of women, LGBTI persons, and other oppressed groups should also be noted. 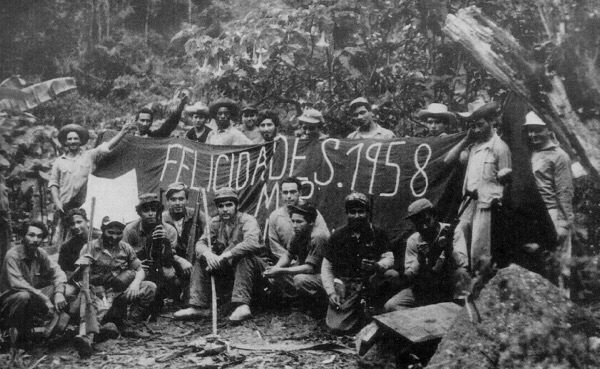 But, despite these problems, US imperialism was unable to break this revolution: one cannot understand this resistance without taking into account the anti-imperialist, national, popular dynamic, of a socialist character, of the revolution of 1959. Let us remember that the Cuban revolution overthrew the possessing classes of the period. If the regime has held on, it is because it was the expression of this great Cuban dignity, of this profound aspiration to national and popular sovereignty of this people, of this formidable refusal of a return to the situation preceding the revolution, which had seen Cuba become the “brothel” of the United States of America. The Cuban resistance would not have had this strength without the initial conquests of the revolution, and a series of social gains, especially when compared to other countries of Latin America, in particular at the level of health and education. This dignity is also expressed in one of the facets of the international policy of the Cuban leadership: support for revolutionary attempts in Latin America in the 1960s, the struggle of Che Guevara, or the support in Angola to those who were opposed to the regime of apartheid South Africa. There was also, unfortunately the support for the Soviet intervention in Czechoslovakia, in August 1968. But internationalism has always been a fundamental value of education in Cuba. Today, it is still being reflected by the sending of doctors around the world, Venezuela in particular, but also in Africa where the humanitarian work of Cuban doctors and volunteers is recognized globally in combating the Ebola virus. Cuba is also an example in the choice of a sustainable development, according to environmental organizations which relate human development to the calculation of consumption of energy and resources. This resistance has been strong enough to stand up to the politico-military confrontation with US imperialism, but not enough to resist the pressures of the capitalist world market. Once more, it is tragically confirmed that we cannot build “socialism in one country.” This pressure has penalized and distorted an economy which is insufficiently diversified–tourism, monoculture of sugar, exploitation of nickel–and too dependent on imports, notably basic needs products. The introduction of market mechanisms in the Cuban economy has been encouraged with the “cuentapropista” (self-employed) economy but also the layoffs of those employed in the public sector, including in the sugar enterprises. It has strengthened and crystallized inequalities between a dominant layer of the state apparatus linked to the military hierarchy often in business with big capitalist companies and multinationals, also those who have access to the dollar (a privilege of those who have relatives abroad or work in the tourism or biotechnology industries) and the vast majority of the Cuban people. These inequalities and the strengthening of this dominant layer could constitute the foundations of an evolution of the Vietnamese or Chinese type–a state capitalism and an authoritarian bureaucratic Communist Party regime–with specific characteristics. Except that Cuba is not Vietnam, and still less China. It is difficult to see how this type of system could ensure the national independence of Cuba. Located 150 kilometres from the USA, under the pressure of United States imperialism and the Cuban-American bourgeoisie in Miami, Cuba can only resist through social mobilization and the resumption of the revolutionary project. During the past few years, the Cuban leadership has been able, in the face of these contradictions, to rely on aid from Venezuela, in particular through the delivery of tons of oil at prices defying all competition, but today, the difficulties of Maduro and the post-Chavez regime mean it is not possible to help Cuba as it did during the last decade, hence an anticipated worsening of the economic situation, and the importance of loosening the grip of the US blockade. The broadening of the capitalist market in Cuba is heavy with dangers: the development of casualization, of inequality, challenges to national sovereignty, and the end of sustainable development, among others. In addition, US imperialism will certainly attempt to obtain concessions from the Cuban regime (like, for example, “freedom” of commerce) in exchange for the lifting of the blockade. Cuban revolutionaries celebrate New Year’s Day in 1958, the year before the overthrow of Batista. This is a statement from the Bureau of the Fourth International, of which Solidarity is a sympathizing section. Members of Solidarity have a variety of perspectives on Cuba, some of which differ substantially from the views in this statement. See for example this article by Solidarity member and New Politics editor Dan La Botz.